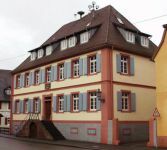 © Ortsverwaltung SchutternKarl Drais obtains a position as forestry inspector in Schuttern under the guidance of master forester baron von Neveu who resides in the forester's house of Gengenbach. The latter prefers to do everything himself and delegates merely the dirty work to Karl Drais (presumably he has sons on stand-by himself). After one year father Drais advises his son to chuck forestry service in and to move to the capital Karlsruhe to be noticed at court. This works out and he following year the father manages the feat to have Karl appointed forestry master without district. But then Karl Drais works already on the solution of an algebraic equation.